Many people mistakenly assume that elective (optional) procedures, such as cosmetic surgery, aren't as serious as other types of surgery. But all surgeries, even simple dental procedures, present the possibility of serious complications. In addition to the general risks of surgery, there's always the possibility of issues arising due to anesthesia. In some ways, cosmetic surgery can be more challenging than more standard surgeries if the patient doesn't tolerate surgery well. Many of these procedures are done in surgery centers or in an operating suite in the physician's office. For most patients, this isn't a serious concern. For the patient who becomes critically ill during surgery, being in a facility with an ICU and extensive resources for the very sick patient can make a tremendous difference in the outcome. Poor Cosmetic Outcome: This may be the greatest fear of a plastic surgery patient: a result that not only fails to improve appearance but actually makes one's appearance worse than before the surgery. Nerve Damage or Numbness: In some cases, nerves may be damaged or severed during any surgical procedure. The result is more obvious, however, if it is a facial nerve. When those nerves are injured, the outcome can be the inability to make facial expressions or drooping of the eyes (ptosis) or mouth. Infection: All surgeries carry a risk of infection. Proper wound care and frequent hand washing can minimize or prevent an infection. Hematoma: A hematoma is a collection of blood outside of a blood vessel. A hematoma can develop after surgery; this typically results in an area being swollen and bruised in appearance, with a pocket of blood beneath. In some cases, this is minor, but a hematoma can be large enough to cause pain and even decrease blood flow through the area. In the case of a large hematoma, the surgeon may choose to remove some of the collected blood with a syringe or other similar method. Necrosis: Tissue death can be caused by surgery or by issues that arise after the procedure. In most cases, necrosis is minor or completely absent, and normal wound healing removes any dead tissue from the incision area. Bleeding: As with any surgical procedure, bleeding can and will occur. Bleeding becomes an issue when it is excessive, or continues after the wound should have healed. Post-surgery bleeding can be a sign that the patient is being too active too soon after the procedure. Death: Every surgery has a risk of death. While that risk may be less than one percent, it's possible for death to occur during the most minor of surgeries. In many cases, this is due to a reaction to anesthesia. Seroma: A seroma is similar to a hematoma: it's a collection of lymphatic fluid around the site of injury. In a seroma, clear fluid builds up in a pocket near the surgical site. If a large amount of fluid accumulates, the surgeon may choose to reduce the pocket by removing fluid with a syringe. Seromas are common with more invasive cosmetic procedures, such as a tummy tuck. Blood Clots: A blood clot is a common risk of many procedures, not just cosmetic surgeries. The most common type is a deep vein thrombosis (DVT), a clot that develops in the leg. Most DVTs require medical attention but are not life-threatening unless the clot begins to move through the veins toward the heart and lungs. A clot that moves to the lungs is a medical emergency and must be treated immediately. 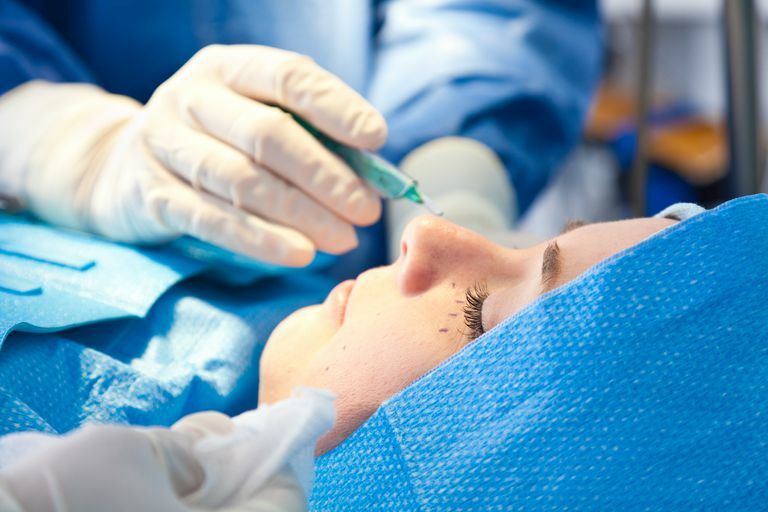 Anesthesia Issues: Most patients tolerate anesthesia without difficulty; however, anesthesia-related complications are the leading cause of cosmetic surgery deaths. The risk is very slight, but it does exist, which is why even elective procedures need to be taken seriously. Like any surgery, the patient has the ability to reduce the risk of complications. The best way to reduce the risk of a bad outcome is to choose the surgeon who performs the procedure wisely. Lifestyle changes, such as quitting smoking, are extremely important before surgery, as non-smokers heal faster and have less scarring. Some plastic surgeons will not perform surgery on current smokers because the final outcome may not be as good. In addition, eating a healthy diet before and after the procedure can speed healing and improve wound closure, which also minimizes scarring. Cosmetic Breast Surgery. Medline Plus.